Mouse anti Human SIRT6 OTI1G3. Human recombinant protein fragment corresponding to amino acids 88-352 of human SIRT6(NP_057623) produced in E.coli. 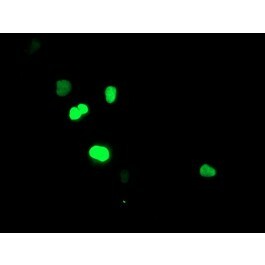 This gene encodes a member of the sirtuin family of proteins, homologs to the yeast Sir2 protein. Members of the sirtuin family are characterized by a sirtuin core domain and grouped into four classes. The functions of human sirtuins have not yet been determined; however, yeast sirtuin proteins are known to regulate epigenetic gene silencing and suppress recombition of rD. 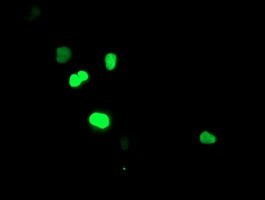 Studies suggest that the human sirtuins may function as intracellular regulatory proteins with mono-ADP-ribosyltransferase activity. The protein encoded by this gene is included in class IV of the sirtuin family. Altertive splicing results in multiple transcript variants.